EXECUTIVE SUMMARY: Waves of infectious diseases struck Israel and other countries in 2018, causing considerable concern. Broadly speaking, infectious diseases have the potential to regain much of their power as a factor limiting the size and expansion of human populations. Waves of infectious diseases struck Israel in 2018, as well as other countries around the globe. A host of causes contributed to those waves, which spanned a broad range of diseases without a common denominator. Infectious diseases are a major factor regulating the mortality rates of species. The vectors that affect the spread of such diseases include pharmacological, epidemiological, ecological, genetic, and demographic elements. Pharmacology is a man-made arena through which infectious diseases are tackled. It represents, in essence, a war between mankind and pathogens, whereby vaccines, anti-sera, antibiotics, and, to a limited extent, antiviral preparations are employed. That war is constantly being fought. Pathogens change genetically as they evolve and can develop tolerances towards pharmacological weapons used to attack them. Antibiotics do not work against viruses, and anti-viral preparations can be very difficult to develop. Vaccines remain the cardinal protective tool. Over the course of 2018, Israel experienced waves of infectious diseases, primarily including measles, leptospirosis, Jericho sore, West Nile fever, and rabies. Measles is caused by an extremely contagious virus that passes from human to human with no animal involvement. The disease has a relatively long period of incubation – 10-12 days – during which no signs of disease are observable in the infected. Because measles is transmitted easily, more than 95% of a community must be vaccinated to achieve effectual population immunity. Normally, individual immunity lasts all of one’s life. In 2018, about 3,150 people were diagnosed with measles in Israel, particularly among non-vaccinated populations. The initial cases were in all likelihood imported. Earlier measles epidemics of note took place in Vietnam in the spring of 2014, in Berlin in 2014-15, and in other parts of Europe. Israel is still experiencing the measles outbreak that began in 2018. The bacterium that causes leptospirosis survives best in fresh water, damp alkaline soil, vegetation, and mud, with temperatures higher than 22°C. For this reason, the number of cases of leptospirosis in Western countries tends to rise in late summer or early fall, and during rainy season in the tropics. The leptospirosis pathogen is transmitted via the urine of infected mammals, such as rodents, deer, rabbits, jackals, wild boar, cows, sheep, and dogs. Globally, it is estimated that 7-10 million people are infected with leptospirosis annually. Of those, about 1 million cases are severe, with 58,900 resulting in death per year. The number of new cases is difficult to estimate, however, as many diseased or suspected cases are untraceable. This is due to the difficulty in differentiating the disease – the symptoms of which vary greatly – from other similar clinical conditions. In Israel, leptospirosis is relatively uncommon, with only 5-10 human clinical cases per year. But the combination of animal infections, particularly of cows and wild boar, together with several consecutive years of drought, led in 2018 to a contamination of non-flowing water bodies in the north of the country – the optimal conditions for leptospirosis. The result was that 630 people were suspected of having contracted the disease in Israel last year. Jericho sore is caused by a unicellular parasite. Sandflies in Israel and surrounding areas contract this parasite from infected rock hyraxes (a small mammal native to the Middle East and Africa). Over the past decade, there has been a rise in human morbidity from Jericho sore in new locations, such as in communities of the West Bank. In recent years, the rock hyrax has reached the urban environment, where it finds abundant food and comfortable living conditions. Its new presence in population centers has significantly elevated the risk of the spread of Jericho sore. This was seen in the form of local outbreaks in West Bank neighborhoods in 2018, where over 47% of casualties were children up to age 14. Children are particularly vulnerable to being infected as sandflies generally fly close to the ground. Worldwide, Jericho sore currently affects 6 million people in 98 countries. About 0.9-1.6 million new cases occur each year. The occurrence of West Nile fever, a mosquito-borne virus, in Israel and elsewhere has increased in the 21st century, due primarily to the invasion of the Asian tiger mosquito. The year 2018 was exceptional in its severity, with major outbreaks across many European countries and in Israel. As of mid-November 2018, 139 cases of West Nile fever had been diagnosed in Israel, of which 76 developed neurological complications and seven died. There has also been an increase in recent years in the number of infected animals (mostly wild birds and horses, which constitute the natural reservoirs of this virus). Higher temperatures around the globe are linked to this trend in two ways: 1) they decrease virus replication time, and 2) they increase viral load in birds and mosquitoes. Also, mosquito populations are expanding into areas where temperatures are rising, as they live longer in such conditions. The West Nile virus, which has a long history in the eastern hemisphere, invaded the US for the first time in 1999. It has since spread across the country. In 2003, there were 9,862 cases of the virus in the US, including 264 deaths. Rabies, a deadly viral disease of man and other mammals, is found in and along the northeastern borders of Israel among jackal populations. In 2018, 58 cases of diseased animals – an appreciable number – were detected. (Forty-five were jackals, seven were cattle, and six were dogs.) Around the world, only a few countries were entirely without rabies. India continues to be the most afflicted, with an estimated 20,000 people dying every year from the disease – more than a third of the total mortality rate from rabies across the globe. On a global level, the following infectious diseases are also worthy of note as they are serious menaces. Cholera is caused by a waterborne germ. Yemen is experiencing the worst cholera epidemic in recent history, with more than 100,000 people contracting the disease in 2018. This crisis is a direct corollary of continuing war conditions in the country. Around the world, 4 million people become sick with cholera each year. After an encouraging pause in 2016, Ebola reemerged in a limited outbreak in Africa in 2017. Then, in 2018, a wide epidemic affected about 700 people and killed 386. This viral disease is exceptionally virulent, with a mortality rate of 55%. 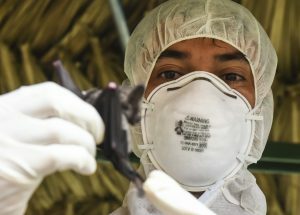 It is estimated that from April 2015 to January 2016, about 1.5 million people were infected in Brazil with Zika fever, a mosquito-borne viral disease. It thereafter spread across large areas of America, and, secondarily, to Africa and Asia. Fortunately, Zika fever is basically a benign infection. It does, however, have a serious complication in the form of microcephaly in the fetuses of infected pregnant women. AIDS is considered a pandemic (a disease that is present over much of the globe and is actively and consistently spreading). Worldwide, nearly 40 million people are currently suffering from AIDS, while about 1.8 million new cases are recorded every year. AIDS results in about one million deaths annually. More than 200 million people contract malaria each year, with 450,000-730,000 dying of the disease. Rates of this mosquito-borne illness have increased since 2014. The pathogen has developed a resistance to several antimalarial medications: for example, chloroquine-resistant malaria has spread to most malarial areas, and resistance to artemisinin has become a problem in some parts of Southeast Asia. One-quarter of the world’s population is now thought to be infected with tuberculosis, mostly by way of an inactive infection. About 10% of inactive infections progress to active disease, which, if left untreated, kills about half those affected. New infections occur in about 1% of the population each year. In 2016, there were more than 10 million cases of active tuberculosis, which resulted in 1.3 million deaths. This makes tuberculosis the number one cause of death from an infectious disease. Antibiotic resistance is a growing problem, with increasing rates of multiple drug-resistant tuberculosis and extensively drug-resistant tuberculosis. New and evolving diseases from the natural environment – exacerbated by changes in climate, the movement of people into cities, and global trade and travel – may become a pandemic. Drug-resistant forms of diseases previously considered treatable could become widespread again. Climate Change… [in the form of] diminishing permafrost could expand habitats for pathogens that cause disease… Governments in megacities (i.e., over 10 million people) across Asia, Latin America, and Africa may not have the capacity to provide adequate resources and infrastructure, and may be vulnerable to natural or man-made disasters. Morbidity and mortality rates from infectious diseases are shaped by overall human immunity, population density, and the availability of effective anti-pathogen therapies and prophylactics. Some pathogens are transmitted through the air and inhaled, as is the case primarily with measles. Aerial pathogen spread is what propelled the devastating epidemics of smallpox and pneumonic plague in the Middle Ages and later, as well as the 1918 deadly influenza pandemic. There is therefore a fear that non-airborne, highly lethal pathogens, such as Ebola or human-adapted avian influenza viruses, will become airborne. It is also possible that evolutionary genetic modifications of benign pathogens might take place, bringing about overwhelming virulence and drug resistance. This was the case with tuberculosis, as well as with some “predatory germs” (e.g., methicillin-resistant “flesh-eating bacteria”). Also, human expansion around the world increases contact with wild animals. Various animal species, including pathogen reservoirs, adjust to man’s presence rather than being replaced. All in all, it is entirely possible that infectious diseases will regain much of their power as a major factor limiting the size and expansion of human populations, and the struggle between man and pathogens will likely intensify.